Post Doctoral Research Fellow, Laboratory of Comparative Human Cognition, University of California, San Diego, 1981 1982. B.A. University of California, Los Angeles, California. Major: Psychology, 1972. Dr. Robert Rueda was the Stephen H. Crocker Professor of Education at the Rossier School of Education at the University of Southern California, where he taught in the area of Psychology in Education. He also had a joint appointment in the Psychology Department. His research centered on the sociocultural basis of motivation, learning, and instruction, with a focus reading and literacy in English learners, and students in at-risk conditions, and he taught courses in learning and motivation. He is a fellow of the American Psychological Association and of the American Educational Research Association, and is also a member of the International Society for Cultural Research and Activity Theory, the Council for Exceptional Children (Mental Retardation Division; Learning Disabili¬ties Division; Division for Culturally and Linguistically Diverse Exceptional Learners), the American Anthropological Association (Council on Anthropology and Education), the International Reading Association, the California Reading Association, and the National Reading Conference. He completed his doctoral work at the University of California at Los Angeles in Educational Psychology and completed a postdoctoral fellowship at the Laboratory of Comparative Human Cognition at the University of California, San Diego in cross-cultural psychology. 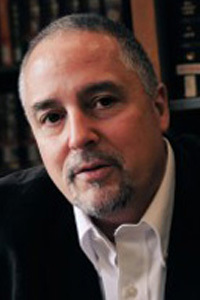 He served as a panel member on the National Academy of Science Report on the Overrepresentation of Minority Students in Special Education, and also served as a member of the National Literacy Panel (SRI International and Center for Applied Linguistics) looking at issues in early reading with English language learners. He recently served as the associate editor of the American Educational Research Journal, and currently serves on the editorial boards of several educational journals. Recipient of Award for Outstanding Research in Elementary, Secondary, or Postsecondary Education from the Hispanic Research Issues SIG (Special Interest Group) of the American Educational Research Association (AERA), April 2007.